I was born November 24, 1935 on a farm in rural Covington County, Alabama, just north of the Florida panhandle to Virgie Lee Hartzog Creel and John Hubern Creel, tenant farmers with very little formal education. I have one brother who was born on May 7, 1939, he retired after serving 26 years in the Army. My father served in the Navy and was discharged due to medical reasons. In 1944 my family moved to Columbus, Georgia, where jobs were more plentiful, Ft. Benning was nearby. I attended High School there and enrolled in a two year ROTC program, which I loved. After High School the Military offered me a chance to leave a dead end textile job. I enlisted in the Army and volunteered for jump school and served a fulfilling six years in Special Forces. 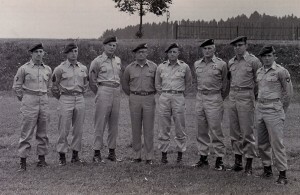 I enlisted in the Army in late October 1954 and after basic and advanced infantry training at Ft. Jackson, South Carolina, parachute jump school at Ft. Benning, Georgia was completed in late April 1955. Those of us who volunteered for Special Forces left Ft. Benning the next day on a long bus ride to Ft. Bragg, not really knowing what was in store for us. We were assigned to FB5 where Captain Wadie J. Rountree, a very outgoing energetic and active individual who seemed to enjoy his role very much. We were billeted in a area adjacent to the 11th Airborne Division’s 187th Regimental Combat Team, a unit that had special capabilities and that could be mobilized quickly. The rest of the 11th was in Ft. Campbell, Kentucky. We moved two other times before I was deployed to the 10th Group in March 1957. The 77th Group was growing rapidly and needed space. After settling into our first home our instruction began and while the specifics are vague at this time one SFC Lundgren was one of our primary instructors for the first few months. He had served with the 10th Group in Bad Toelz, Germany. Because we were in our introductory phase of training and on the post thus we were available for General Cleland’s retirement parade in June 1955. While we officially wore the Green Bret for the first time in public at the parade, we always wore them while in our immediate compound and while in training away from the post. It seemed to us that Colonel Edson Raff, who authorized us to wear them, marched to the beat of a different drummer and was somewhat of a rebel. I never met him, but this is what we heard. In the summer of 1955 we began our travels for training in the Pisgah National Forrest of the North, Georgia area where we were introduced to the full Rucksack, 10-20 mile marches on successive days, several of them, but we were young and it was fun….after it was over. This was followed by repelling down sheer cliffs with an “injured” man on a stretcher between two people, the stretcher secured by a rope held by individual(s) above, you know the drill. That was real fun. Our Instructor for this was none other than SGT., Larry Thorne, THE LORI TORNE, later Captain. After Pisgah we spent a lot of time at Camp MacCall on various training exercises, survival, followed by roughly SERE of our time. Always on the go from then on with no free time. October 1955 took us to Camp Carson, Colorado, then, and Cheyenne Canyon and a continuation and refining of the mountaineering in North, Georgia. We then moved to Camp Hale, Colorado near Leadville, for pack mule and mountain maneuvering. We were in Colorado for a total of two months. In January Norfolk, Virginia was our destination for submarine training and surfacing off camp LeJeune, North Carolina. Our submarine, the Sea Lion surfaced in storm warning weather in order for us to row to shore. Because of the severity of the weather, almost all of the rafts capsized and we lost one man. A quick head count accounted for everyone, but one marine was included in the inconclusive count. The young man washed ashore two days later. I think it was determined that his weapon struck his head rendering him unconscious and he drowned. In February 1956 we were off to Colorado again for two more months, this time to Camp Hale again for winter mountaineering, which included snow shoeing, cross country and downhill skiing, followed by a two week team trek for each team separate from the others. Many of us, me included, had never seen snow before but we adjusted and flourished. Learning to ski was one of the most enjoyable experiences of my life and I still enjoy it today. Our team was assigned to an area just below timberline at about 11,000 feet at the foot of Mt. Elbert at 14,431 feet, the second highest peak in the continental USA behind Mt. Whitney, CA. Each of us called upon to pull an akin, which looked like a canoe on runners with all of our gear and food from our drop off point to our camping spot. I think the temperature hovered around zero degrees for over two weeks. honor graduate of the course, within three months was promoted to E5. The last half of 1956 most of us were heavily involved with specialty training, my Military Speciality (MOS) was communications, 051.63 (Radio Operator). In the 77th Group, Captain Coupland and SFC Richard Perkins, team Sergeant were our leaders. SFC Perkins was drafted into Special Forces because of his WWII Combat Record. Reportedly, he was attached to a British Commando unit for some special operation and was awarded the Victoria Cross. He came to SF as a leg and was sent to jump school afterwards. I came to know him a little more than most because I introduced him to a much needed girlfriend. Nothing came of that relationship, however we became very good friends. Perkins was with us through the last Colorado trip in early 1956, that was the last that I saw of him until the 2004 SF Convention in Las Vegas. Perkins told me that he was sent to Okinawa to help form the first Special Forces Group. He remained with the 1st Group until he retired. Without minimizing other life events the time (4 years) spent in Bad Toelz with the 10th Group was by far the most meaningful, fulfilling and rewarding time of my life. To experience first hand another, although similar culture, study and learn a foreign language, use it on a daily basis, still do, gain a wife and her family who treated me like a son! My life was shaped by the time spent in Special Forces…It still is!